This is a fun and simple craft technique that you can use on just about anything! - 2 Apples (Any type are fine) Sliced from stem to bottom. 1. Prep your space with a plastic table cloth or newspapers. Paint will go through. 2. Slice your apple in half. 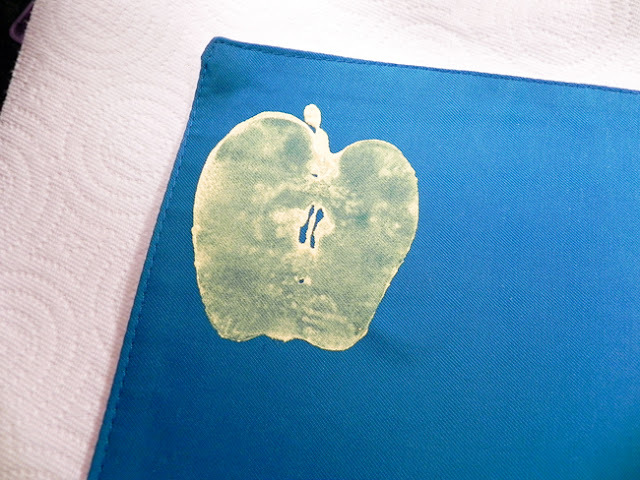 Blot it on a napkin well to dry it off. Have paints ready on a plate. 3. 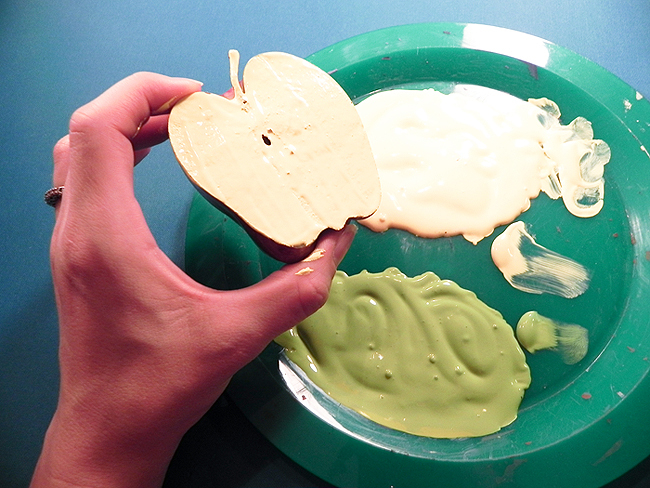 Stamp apple in paint generously. But blot paint off it its too much on an extra napkin. 4. 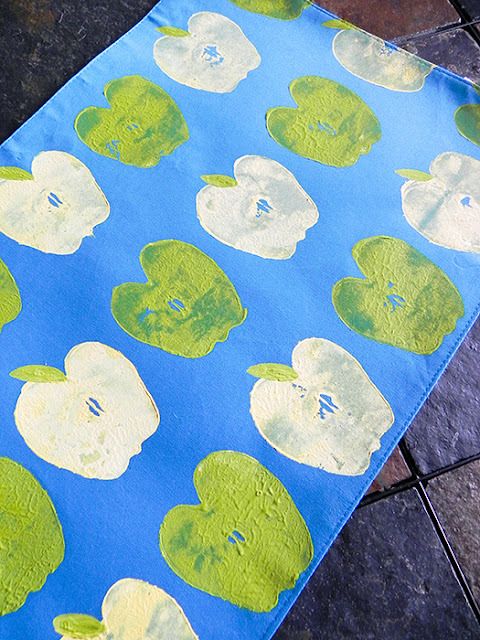 Stamp mats with apple. Press firm but don't twist it. Carefully remove. 5. Repeat pattern with other colors. When all done you can go back with your paint brush and add a leaf to every other apple or so. With every apple I did I stamped it twice to get a really thick apple image. If you continue to get a spot you want covered, use your finger with a little paint and lightly blot the spot till covered. 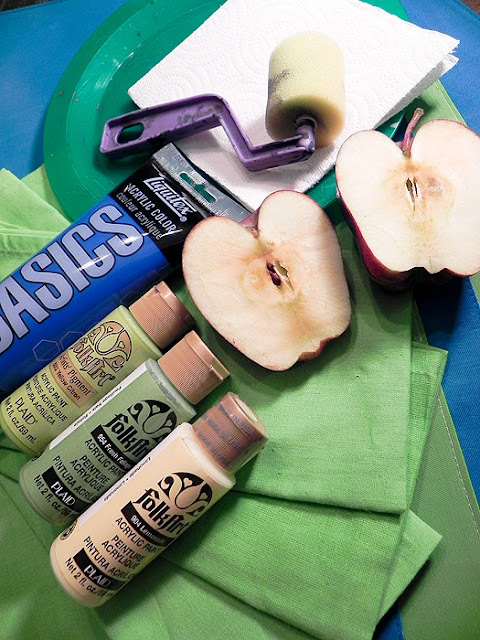 I personally liked the more stamped look but alternatively you could immediately go back and use your paint brush to smooth the apples and make them more crisp. Don't limit this to just apples, try pears too! I've done those and they are really cute. Also select apple of all sizes and shapes for variety. This works great on clothing (use fabric paint), think baby onsies or child tees. Make a greeting card, personalized your wrapping paper, fabric napkins, etc! Those look really cool! What a fun craft to do! Thank you! They are. My girls made these and had a lot of fun! There are soo many possibilities with these stamps! It's a cheap craft too.